The Salvation Army is one of the world’s largest and oldest providers of social services. Originally established in London in 1865, it has been helping people for more than 150 years internationally and for more than 135 years in the United States. In 2017, The Salvation Army’s 3,567 officers, 63,743 employees, and 3 million volunteers served more than 23 million Americans in need. That’s almost one person every second, every day. The Salvation Army’s faith-based mission calls it to meet human needs in His name without discrimination, regardless of gender, race, sexual orientation, physical disability, age, creed or religion. The Army has 7,617 centers of operation covering every ZIP code in the country. We also have a worldwide presence, assisting people in 130 countries around the world. The Salvation Army serves millions of people through services directly targeting the needs of local communities – from homelessness, hunger, and Christmas assistance to disaster relief and substance-abuse rehabilitation. Serve more than 52 million meals to the hungry. Offer rehabilitation services to 147,000 people struggling with substance abuse and addiction. Send 427,119 underprivileged children to day care and summer day camps. Provide over 9.9 million nights of shelter. Help more than 241,000 people in times of disaster. Give food, toys, clothing and other needed items to nearly 3 million families and children during the holidays. Offer senior, medical, and institutional services to 1.5 million people. Since 2015, The Salvation Army has partnered with the Indiana University Lilly Family School of Philanthropy to measure the Human Needs Index (HumanNeedsIndex.org), a new approach to understanding poverty in the U.S. that draws on The Salvation Army’s rich collection of service-related data. Unlike traditional measures of poverty, the HNI comprises indicators that represent need substantiated on consumption rather than income. Thus, the HNI’s greatest strength is that it illustrates a more intimate portrayal of need than any other index. The Salvation Army is a responsible steward of generosity in every community. As a national average, 82 cents of every dollar The Salvation Army spends go directly to support community service programs – far exceeding the Better Business Bureau’s guideline of 65 percent. 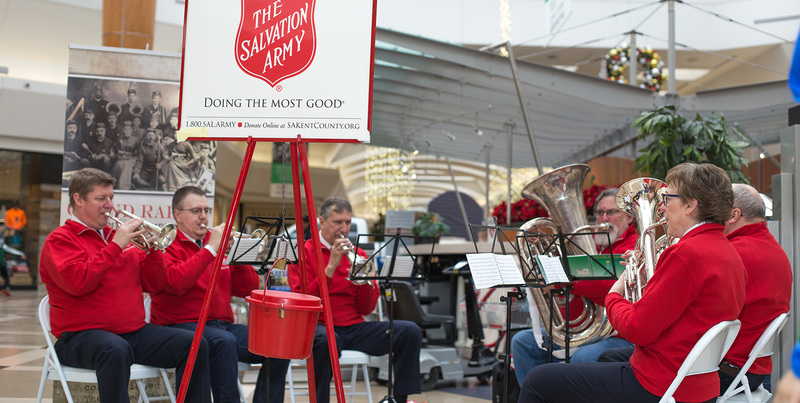 The Salvation Army enjoys and appreciates the support of many major corporate donors at the national and local levels. Nationally, major supporters include Walmart Stores, JCPenney, the Dallas Cowboys, Target Corporation, FedEx, UPS, and Krispy Kreme. All donations remain in the communities where they originate. Thank you for your support of The Salvation Army!